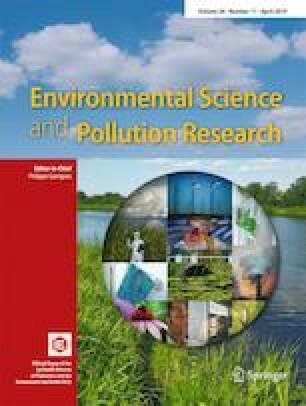 The current study was conducted in the Cua Dai estuary, Vietnam, (1) to assess the status of persistent organic pollutants (POPs) and (2) to examine the interactive effect of season and estuary position on the concentration of the pollutants in surface water and sediment. Fifty-two water and sediment samples were taken in the dry and rainy seasons from inner- and outer-estuary positions to analyze for six POPs, including hexachlorocyclohexane isomers (HCHs), dichlorodiphenyltrichloroethane and its metabolites (DDTs), heptachlor, aldrin, dieldrin, and polychlorinated biphenyl (PCBs). The averaged concentrations of the respective POPs in water samples were 0.07, 0.1, 0.01, 0.03, 0.001, and 0.2 μg L−1 and in sediment samples were 2.6, 3.1, 0.9, 0.2, 0.2, and 121 μg kg−1. Of the six POPs examined, the concentration of DDTs in sediment samples and PCBs in water samples was significantly affected by the interactive effect of the two examined factors. The concentrations of HCHs, DDTs, heptachlor, and aldrin in water samples and of HCHs in sediment samples were significantly higher in the rainy season than in the dry season. Sediment samples collected from the inner position had a significantly higher concentration of HCHs and PCBs than in the outer position. Some mechanisms possibly influenced the varying POP concentration could include (1) greater riverine discharge in the rainy season and (2) the sea dilution effect in the outer position. Therefore, the concentration of the individual examined POPs in water and sediment in the Cua Dai estuary significantly depended on either the season, estuary position, or their combination. The online version of this article ( https://doi.org/10.1007/s11356-019-04238-7) contains supplementary material, which is available to authorized users. The authors are thankful to the personnel of the Faculty of Environment, Hanoi University of Natural Resources and Environment, for their help with fieldwork. The current study was partially funded by the Ministry of Natural resources and Environment.